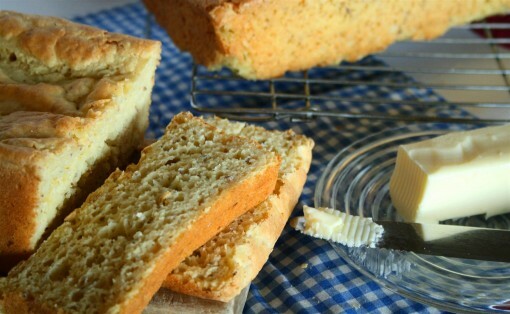 Favourite Gluten Free Bread was posted on September 5th, 2011 and is filed under Breads & Muffins, Dairy Free, Gluten Free, Recipes. This entry has 14 comments. You can follow any responses through the RSS 2.0 Comment Feed. In our family there are a few allergies. Some of us don’t do dairy (or very much) and some don’t do gluten. I am supposed to be allergic to dairy, but it wasn’t exactly “proven”…so I still eat yogurt and some cheeses. Haha, so maybe I cheat. But really, besides that and the rare bowl of ice-cream (Yup. One of my weaknesses) I pretty much boycott dairy. I don’t like cow’s milk anyway…it makes me feel…sorta icky. Thankfully though, I’m not allergic to wheat. I try to stick with organic whole wheat flour and I have very little bread products compared to what I used to consume. Before, I’d have bread at breakfast and lunch and often a slice with dinner. That was too much. Yes, it was organic, healthy, whole wheat bread, but it was still just too much. Now I might have a slice a day. Maybe. I’ve found I feel a lot better without as many carbs in my life. But I still love my bread and cannot ever give it up. I feel sorry for people who can’t have bread because they’re intolerant to gluten. Like my Dad. He’s on the extreme side of allergic. I’ve never seen him eat anything with gluten my whole life. But we do our best to spoil him with gluten-free baking and make him his own bread from brown rice flour. It’s kind of an amazing recipe. I love his bread and could eat stacks of it…it’s so delicious; you’d never know that it’s gluten free! This is a staple in our house and we make it almost every week. Sift the first four ingredients together and put in your mixer. Dissolve 1 tbsp. of the sugar and the yeast in ½ cup of the warm water. Set aside. Now add the rest of the sugar, warm water, oil, eggs, flax, and vinegar. Mix on high for 1 minute. Add the yeast mixture and mix on high for 4 minutes. 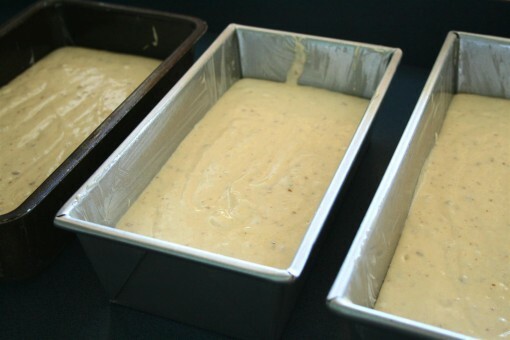 Spoon into 3 greased loaf pans and set in a warm place to rise. Only let it rise to the top of the pans. Bake at 400 degrees for 40-45 minutes. Makes 3 loaves. And after it’s baked…it becomes a beautiful light yellow loaf. This bread doesn’t rise very high, so you just have to have to eat at least two pieces! 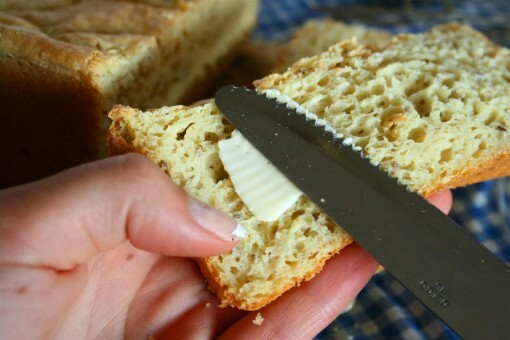 One of my favourite things: Fresh, warm bread from the oven…with a little butter. And then watching the butter melt into the slice before I devour it. Note: We usually just keep one loaf out at a time and freeze the other two until we need it. The problem with gluten free bread is that it often starts to crumble and dry out when it gets a little old, so freezing it really helps keep it fresh. Do you have any allergies? Have you ever tried any gluten free baked foods? Looks healthy and delicious. I’ll try make it. Love the photo. I think I have been blessed without any food allergies. But I like how you have adapted to them. Rockstar! It looks like you got great texture and height! I want to make this for my cousin, who we just discovered has a gluten allergy. Thanks for sharing! Nice. I would love to try this. Can’t live without bread. This looks great and I would love to try the gluten-free too. I have a couple friends/family members who are gluten-free as well…I’m going to email this post to them, thanks for sharing! This bread looks great! It has a wonderful texture. Thank you for sharing! My Dad is supposed to be gluten free but he has been acting bad lately, sneaking rolls and even bagels sometimes(!). He doesn’t have as severe an allergy as your Dad, just gets IBS if he over does it. But I think he sneaks because he misses the food (I can’t blame him). I’m going to have to try making him this bread. If I can show him gluten free can still taste as good as the regular stuff he won’t have to sneak as much (or at all, hopefully). I’m gluten and dairy free! Cannot wait to try this bread. Thanks!! I haven’t done any gluten free bread yet because I’m not able to find guar gum. do you have any suggestions for substitute? Shannon ~ Use xantham gum – we just use guar gum because it’s cheaper than xantham. I think for both ingredients you will have to pop into a health food store (or the health food aisle of your grocery store), but they’re not too hard to find. You can get them at Save On Foods, Superstore, Whole Foods, ect. Charissa, thanks so much for posting this recipe. 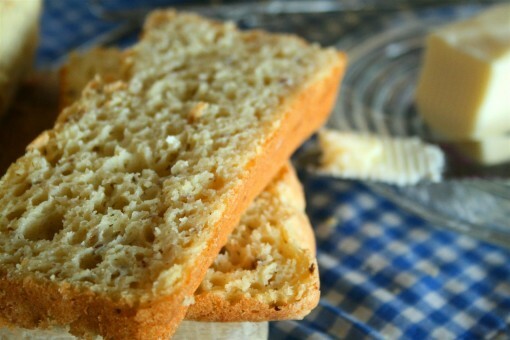 I loved having this as toast for breakfast while I was staying with you last weekend – Delicious!!! I am very excited to add this recipe to my life because I have not found bread recipes that even come close to the delightful taste and texture of this loaf since discovering my allergy. Keep up the great work!